Touchscreen Functionality -- Super clear window on both sides that is perfect for text, taking and listening by accessing touch screens without removing the case, so you can conveniently take photo or video underwater without worry. 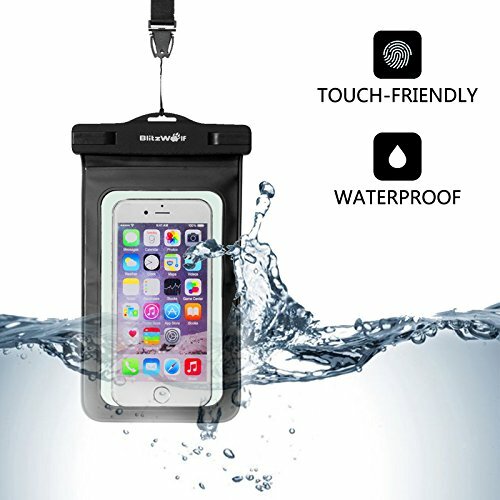 Durable Material -- TPU+ABS material allows a soft, comfortable grip for your waterproof bag. Dry bag case also comes with the safe clip that is easily carrying when swimming, travel and go boating. Double-sided transparent Design is perfect for shooting and carrying your passport, tickets, and credit card. Lifetime Quality Care -- BlitzWolf offers 18 months warranty and lifetime dedicated consultancy to assure your long term enjoyment.